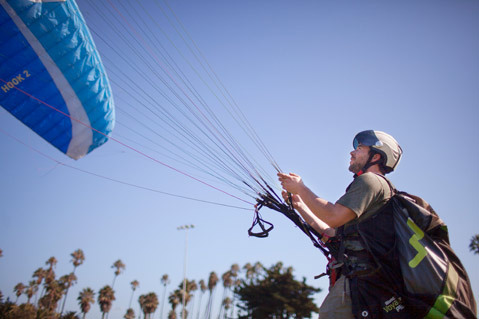 “Every single paraglider watches the hawks; you just have to keep an eye on them,” said Daniel Pelaima, who was raised in Santa Barbara and now lives in Tahoe. Pelaima cleans out the wings of his paragliding equipment at Chase Palm Park after a day of flying in the mountains with a friend. Chris White of Santa Maria hula hoops behind her booth at the Sunday Santa Barbara Arts & Crafts Show on Cabrillo Boulevard. 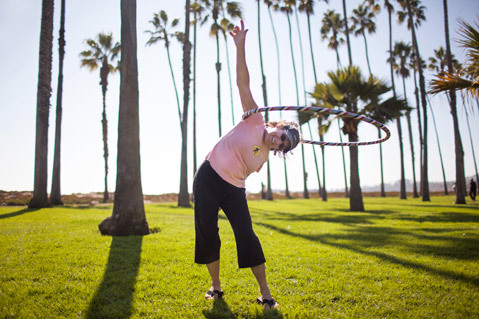 White, a retired preschool teacher, has been providing hula hoops for the people of Santa Barbara since 2005. “This is paradise! If I get sick of looking at the mountains, I can just turn around and look at the ocean!” she said.